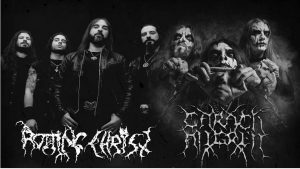 Os Gregos Rotting Christ e os Holandeses Carach Angren são duas das bandas mais sombrias da Editora Season Of Mist , mestres cada um no seu estilo diferenciador de um Black Metal excepcional, em conjunto organizaram esta Co Headliner Tour que felizmente passa também por Portugal a 9 de Fevereiro no Porto e a 10 em Lisboa! 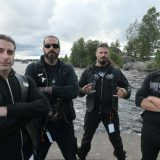 Como convidados trazem Svart Crown uma banda a descobrir! Os bilhetes já estão à venda nos locais habituais! 22€ antecipadamente! Passa a 25€ no próprio dia! 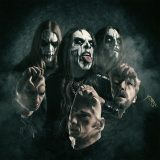 CARACH ANGREN have employed all the sonic colours on their palette to dazzling effect. Their trademark whipping guitars are weaving harsh melodies and sinister soundscapes, which are beautifully contrasted by opulent keyboards and majestic orchestrations. That Till Lindemann (RAMMSTEIN) and Peter Tägtgren (PAIN) have called upon the composition talent of Clemens “Ardek” Wijers is a telling sign of his outstanding mastery of the craft. Another signatory counterpoint is provided by Seregor’s fierce rasping and shrieking vocals. Adding to the impact, Namtar has become a relentless driving force with his hart hitting yet intricate drumming. Each track on this album is a highlight on its own, while combined ‘Dance and Laugh amongst the Rotten’ simply shines.